So after posting the rules and guidelines for the Ironman Challenge, I opened up a poll to decide what race and class I should play for this. Declaring that I couldn’t trust myself to make it too easy or too hard, I figured my loyal and always appreciated readers should decide what I should play and what they would read about. He is Ironkerion (get it?) an Undead Warlock. I’m a bit shocked that one came out on top. I figured people would pick a hard class for me to do this with (okay, the runner up was warrior. But warlock just barely beat it. Okay fine there’s an uproar about it, I can switch.) So a pet class it is. I’m actually a bit intrigued, I haven’t played a warlock since early WotLK, and that toon was mostly leveled during Burning Crusade (My first max level toon actually). So this is semi nostalgic for me. He’s currently level 5, dressed in the all white gear you can find off of the Deathknell cloth armor vendor, and just setting off into the great big world. In case you want to follow along or see if I’m around to say hi or anything, Ironkerion is on the horde side (duh) of the Zangarmarsh realm – US. So all you folks in <It Came From The Blog> better say hello. 😉 He’s currently my only toon on that realm, so it’s definitely a “no financial aid” situation. My imp is named Grobham or something like that. It seems oddly fitting. I too enjoy grob and ham. Often with a side of hathuun and rice. Expect many a joke about demon names folks. This is what you voted for. Night Elf, Dwarf, Orc and Goblin: 2 votes. Human, Draenei, Worgen, Blood Elf: 1 vote. Priest and Mage: 3 votes. Druid, Paladin and Hunter: 2 votes. Posted on July 8, 2011, in Ironman Challenge and tagged forsaken, Ironkerion, Ironman, Ironman Challenge, It Came From the Blog, poll, warlock, World of Warcraft. Bookmark the permalink. 11 Comments. But maybe the lack of power from your gear might compliment that and help the old blue berry out. I was very skilled with aggro management with my Blueberry back in BC. ^_^ Took forever and mostly consisted of DoTs and Wanding, but it got me all the way to 70. Of course the lack of gear being a factor now, who knows! This will truly be a bold scientific exploration. [Awesome]: As a Gnome you command everything to be AWESOME. At least 95.3% (Repeating, of course) as awesome as you. [Isn’t it Adowable? ]: You are gnome. You are cute. Deal with it. Ironkerion looks like he’s got the attitude to succeed. I believe in him! I had finally decided on my race/class and read your post so decided to roll her on Zangarmarsh. I know I can’t group with Ironkerion but I can wave if I see him and he’s such a handsome devil, isn’t he. Undead Mage, level 5, Ironmary. 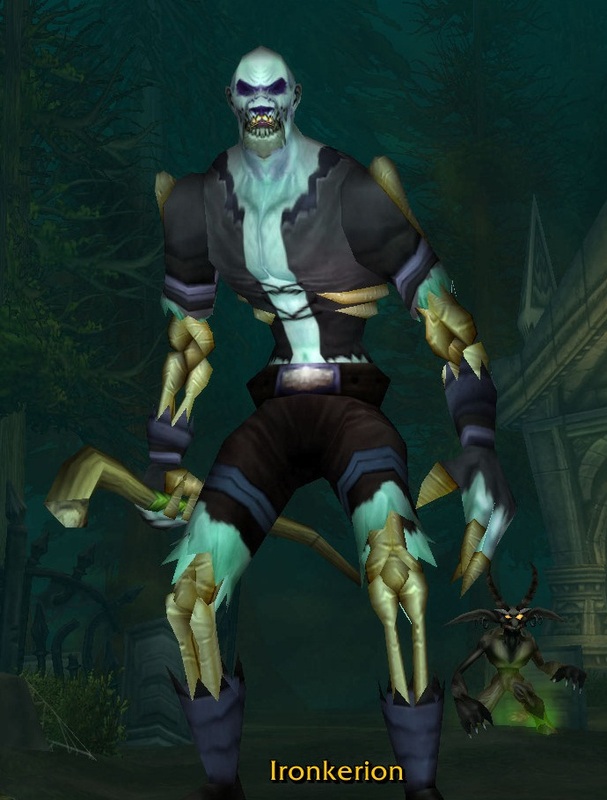 After reading Ironyca’s article, I thought I’d drop by and see what race/class you’ve had chosen for you and I think Undead Warlock is going to be great. I’d definitely recommend looking out for some low level rares early on. From my experience, the level 4-6 rares always drop 6 slot bags! I may have just been lucky, but definitely check them out. I farmed a couple of rares in Dun Morogh on Maedra and having four 6 slot bags was a great help early on. Anyway, I wish you all the best for this challenge. It won’t be easy, but with the steely determination that Ironkerion so clearly has (I mean look at that face!) I have no doubt you’ll do it! And thank the titans for that demon. Normal mobs are taking 10% of Ironkerion’s health off in a single hit! And those are mobs 2-3 levels lower than him!